The most common triggers for relapse include stress, negative or challenging emotions, and people or places connected with previous addictive behavior, all of which can be found in the workplace (Sinha, 2008). We each are born with talented minds, that were designed to impact others and accomplish great things. Implicitly, we are called to discover our uniqueness that may be expressed in this world. In that endeavor, we find meaning. Individuals encounter horizontal stressors and trauma that often lead to discontent. To evidence this Gallup (2015) stipulates nearly 70% of our present workforce is disengaged with their work. To reconcile this, individuals often use substances for temporal relief. However, this entraps them in a cycle that leads to a cognitive impasse or feeling "stuck." This affects their mental health and often evolves into measurably lower levels of hope or even a state of hopelessness. In response to this, our Hope-Centered Intentional Change Model ® is integrated into our narrative workshops that offer a process of transformation through vocational and identity development. Subjective narratives inspire individuals to co-construct their authentic self by drawing from prior positive experiences that evidence strengths. Through self-authentication, visioning their future self illuminates tangible goals that create agency thinking or the motivation and purpose of intentional change. Objective assessments serve as instruments that validate one's innate talent as resources to support a pathway to becoming their future self. This is significant because on the spatial intelligence spectrum, individuals need to evidence their giftedness as a empowering agent for owning intentional change. Together, this changes attitude amplifying "why" change is necessary, it effects "how" their emotional response to this new beginning, and they "live into" this behavior because they have co-constructed this pathway themselves. The confluence of these heightens self-efficacy and creates a sustainable cognitive bridge that supports individuals as they emerge from treatment into recovery within the world-at-large. Our mission is to compliment current therapeutic treatment protocols that promote self-efficacy and a cognitive platform for intentional change. Fostering a newfound vocational identity has the propensity for amplifying inner strengths and a sense of hope. Our purpose is to guide individuals to a sustainable pathway that is free from attachments, one of restoration back to wholeness, and one that leads to an abundant life of purpose. Our goal is to engage the hearts and minds of our clients, in the midst of their recovery journey, allowing them to explore "who" they are in order to uncover their authentic self. This Hope-Centered discovery method heightens awareness of "how" to utilize their natural gifts in their personal and professional development. Through this process, clients are empowered to take ownership of their lives and a new direction in life. We help clients see through the distortions brought on by addiction and trauma, to regain the clarity necessary to thrive once again in the workforce. We lead workshops that use an Adler Narrative that subjectively uncovers character strengths, interests, passions, and value sets. These are intended to illuminate and reframe their perception of "who" they are and "why" work roles have purpose. 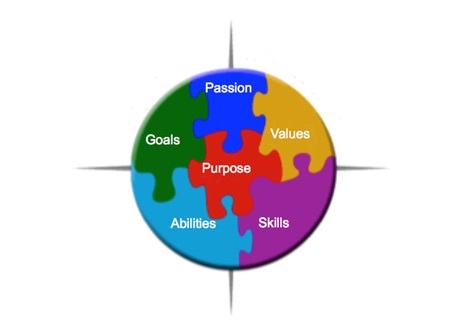 We also administer scientifically validated objective assessments that reveal innate abilities and other thematic characteristics that converge in a congruent process leading to clarity of purpose. This offers a glimpse into their inborn talent that may be used to support purpose driven endeavors. ​During workshops, participants share their insight in dyads where they normalize their concerns sufficiently for self-awareness to heighten a sense of hope. Following workshops, therapists my use these workbooks to draw from their self-reflections, to identify, and expand upon them to compliment their treatment plans. Formatively, this evidenced-based approach reveals the "why," or meaning of behavioral change and "how" pursuing a re-authored life role allows them to reflect their unique nature in a new way of living. Following our workshops and their emergence from treatment, we offer individual guidance that offers continuity. We use their workshop/workbook results and administer more sophisticated assessments that reveal ability patterns that articulate "how" their inborn strengths will empower them to flourish in endeavors that have meaning. What emerges is an authentication of their identity sufficiently for them to co-construct a vocational identity. Finally, what is manifest is a Hope-Centered mindset that they are of inestimable value and worthy of change itself.